French Emblems: Emblem: Aliquid mali propter vicinum malum. Voisinage peult rendre mal. Aliquid mali propter vicinum malum. Altera erat figuli terrea facta manu. Ne mihi proximitas haec mala multa ferat. Ipsa ego te fragilis sospite sola terar. 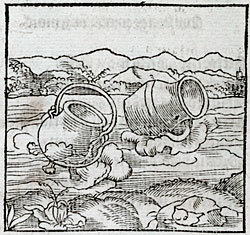 A stream was carrying along two pots, one of which was made of metal, the other formed by the potter’s hand of clay. The metal pot asked the clay one whether it would like to float along close beside it, so that each of them, by uniting with the other, could resist the rushing waters. The clay pot replied: The arrangement you propose does not appeal to me. I am afraid that such proximity will bring many misfortunes upon me. For whether the wave washes you against me or me against you, I only, being breakable, will be shattered, while you remain unharmed. Qui dit au foible telz propos. Si me laissoys a toy toucher.